Organic soaps have enticing aroma, beautiful packaging and exotic combination of flavour making us believe that the soap is non-toxic. In fact, it can be toxic if the method or ingredients or process is compromised. “There are three processes to make soap – melt and pour, hot process and cold process.For the first method, the base is bought. Sometimes palm oil is used to make the base, so that it lathers more and is also cheap. “Cold process is better as you make your own base. However, here you are making a lye solution and you need to take a lot of precaution with the measurement. The other problem is, there is a formula based on which one can measure the ingredients to be put in the soap. But, it keeps on changing.“ says A Agarwal, a handmade soap instructor. “I do organic gardening; hence I use home-grown aloe vera gel to make my soap. It was only after a few trials that I came to know that the cells of the gel are active for just 20 minutes. I keep on reading and experimenting. But, there is no right way of making a homemade soap. In chemical terms, soap is a salt. An acid and a base react with one another and are neutralised to form soap. A more basic explanation is oils or fats combine with sodium hydroxide or ‘lye’ in a process called saponification to produce soap. “I make homemade soaps which are rich in natural oils, fats and butters that are nourishing and moisturising to the skin. 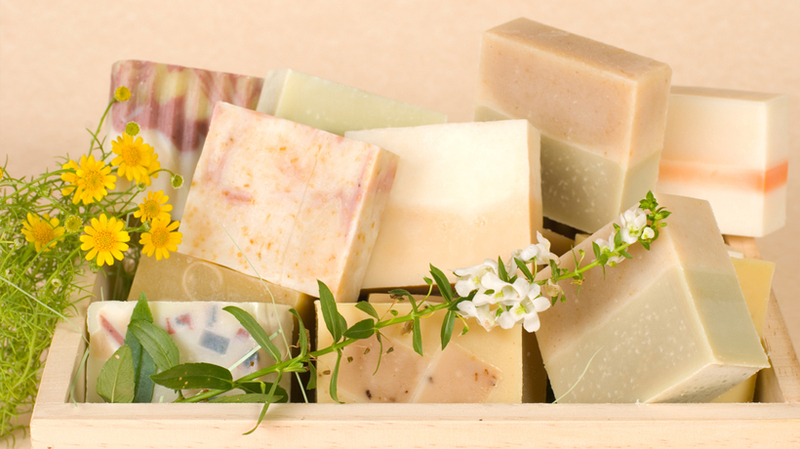 High quality ingredients such as organic oils will produce high quality soap. I have been practising this since many years. But one needs to be careful with the measurements. One mistake on your end and the user suffers,” she says. “Take a look at the ingredients mentioned of the soap that you are currently using. It’ll be something like bath bar, deodorising bar or even a beauty bar. It isn’t really soap. It is detergent made of processing aids, colouring matter, antioxidants, preservatives, permissible germicides, super fatting agents, humectants and chemicals which are harmful to the skin. These detergents strip the moisture from our skin,” says Rajesh, another handmade soap manufacturer. “Homemade soaps are in true sense soaps, if one makes it after gaining proper knowledge about it. My wife and I studied about this for three years under the best mentors in the US and then made this manufacturing unit. We use CPT techniques to avoid overheating of our natural ingredients, so that the volatile compounds stay with our soap for aromatherapy and as alternative medicine,” he said.